Slots tournaments are really popular nowadays. This type of gambling encourages beginners and professional players that is why all casino owners offer slot tournaments. The format of slots tournaments is very simple. The procedure is really exciting because the feeling that you have competitors brings you irresistible desire of winning that makes the feeling grow more intensive. Some special skills for playing slots tournaments are not required; all that you need is a peace of luck. Moreover players know how much they will spend because there is a set entry fee. The gamblers are insured from great losses of money. There are two types of slots tournaments: invitational and Open. So, what are they, let's find out. Usually everybody can play in such type of tournaments, the players don't need to sign up and wait for the invitation. Concerning invitational tournaments they presuppose the invitation card for the game. The gamblers are invited by the casino. Only the gambling house is able to choose the players and invite them. They may call you or send an email. Such tournaments are premeditated by the casino. 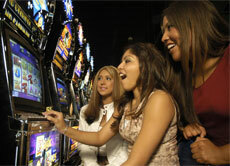 Traditionally it happens that slots tournaments are hold at the land based casinos. Firstly if you want to participate in slot tournament you should register. For this reason you need to show your documents that means to bring your Player's Card. You will not be allowed to play the game without it. When your turn comes you will have a selection to choose the machine you like or which is offered. You will know when to start; the tournaments director will give you a signal. The approximate time for playing will be five or ten minutes. After all this you should push the spin button as quickly as you can. During this you can hear the agitated outcries, yelling in a word everything that is normal for the tournament. When your game ends you should seat until the casino employee come up to you and write down your score. But there are some tournaments where you are invited to play two rounds. It is allowed for the players who have high score for the final battle. After all this, the director announces the winners with the highest scores.